This week's ice storm brought a world of wonder. Even while branches and whole limbs rained down, sometimes tangling in hydro lines and thus plunging entire neighbourhoods into darkness, the strange beauty was an invitation to go outside and look closely. 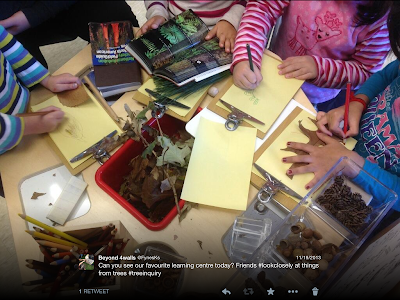 Our big idea this year in class is "looking closely". 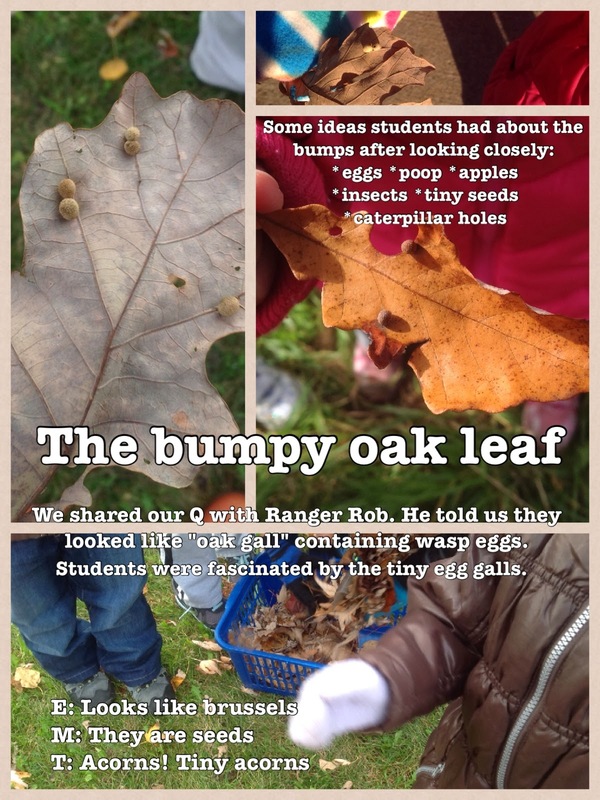 In October I detailed (here) how this project began when Heather McKay noticed a spark, an idea, and turned it into a beautiful collaborative blog, and how this lens of looking closely fit me so well as a teacher and learner. Yesterday and today, walking along the ice-lined streets of my neighbourhood, I was struck by the beauty and destruction wrecked by the ice storm, and how the shock of seeing the world in such a different light causes everyone to slow down and look closely around them. The marvelous old oak trees that line my street, some so large their branches drape over the street and over the houses on both sides, suddenly frightening to walk beneath as they creak and shed ice in the breeze. Stubble in the garden of grasses or long-dead plants, ignored as drab, now stunning in a blanket of sparkling ice. Cold steel fences now dripping icicles, an invitation to strum, to shatter the icicles in a musical burst. Tiny leaves, still clinging to branches long after most leaves have fallen, suddenly gem-like as they shine like coloured glass. Part of the reason the looking closely lens fits so well is that I've tried over the years to use this approach in daily life - early on through Shambhala (in brief: a meditation practice which begins with looking closely at one's breath, and the transient nature of thoughts) and later Miksang (a "contemplative art" practice of photography started by several Shambhala practitioners but practiced by many outside of the sangha. For a long time I thought it was something external to my teaching career, even though I've always been a reflective teacher, using my mistakes or misunderstandings to guide changes in my approach. Over the years it took me to complete my Kindergarten Specialist AQ, the idea of looking closely at myself as a learner and teacher became clear. 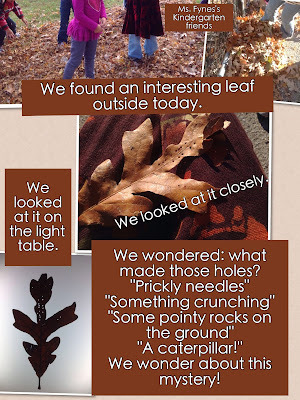 My gradual AQ transformation included ideas from Project Zero's Visible Thinking routines, and my understanding only deepened when we further explored the inspiration of Reggio Emilia. Learning about the place, the people, and ideas from Reggio Emilia was also a homecoming of sorts, in that I realized where my first hero in Kindergarten Nancy Thomas (who I first wrote about here) had found her ideological home so many years before. The quote that elicited a gasp when I first saw it on the wall near the light studio at Acorn School. 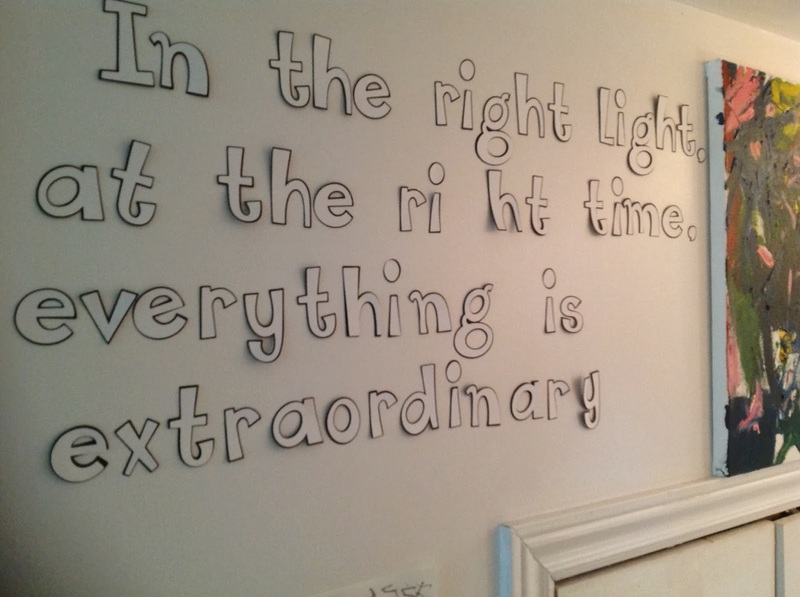 I wonder if the urge to look back at the year, to sum it up, comes from the fact that during the winter holiday break we can step back a bit from the classroom and think about all the learning that has taken place so far. It is also a natural response to looking through the year so far in documentation as I gear up to write the first term reports for my two classes, a process a wise twitter friend Tracy once likened to "falling in love" with her students (I couldn't agree more!). Looking over hundreds of photos and anecdotal notes taken since September, I can't help but see how this year, more than any other year before, the students and their ideas have become the curriculum. 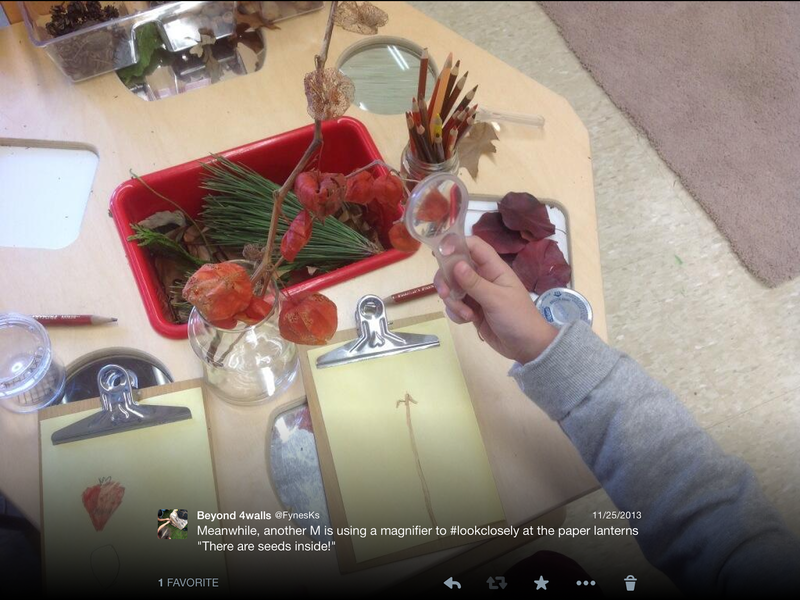 This is to say, I've begun to look closely at teaching and learning through a Reggio-inspired lens. 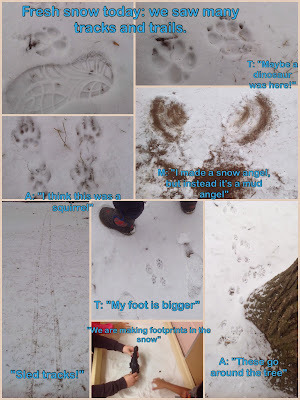 Upon re-reading my "Looking Closely" post on the collaborative blog (included in its entirety below), I noticed how much we had explored the living world just outside our classroom door, how students observed and wondered about everything around them, and how adept students were becoming at noticing even the tiniest changes in their environment. I realized that while I believe I have far to go to and I'm grateful for my PLN for the constant inspiration, I had become the sort of person who a child will give their most precious discoveries to: a snail, a leaf, an interesting stone, an insect, a scrap of newspaper with something interesting, a drawing made at home. 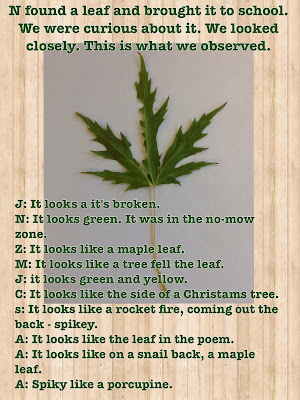 I think I always wanted to honour children's learning, but the trust my students have in my now tells me I'm getting much closer to the real thing. The following was first posted on November 22nd on the "Looking Closely" collaborative blog (you may see the original here). 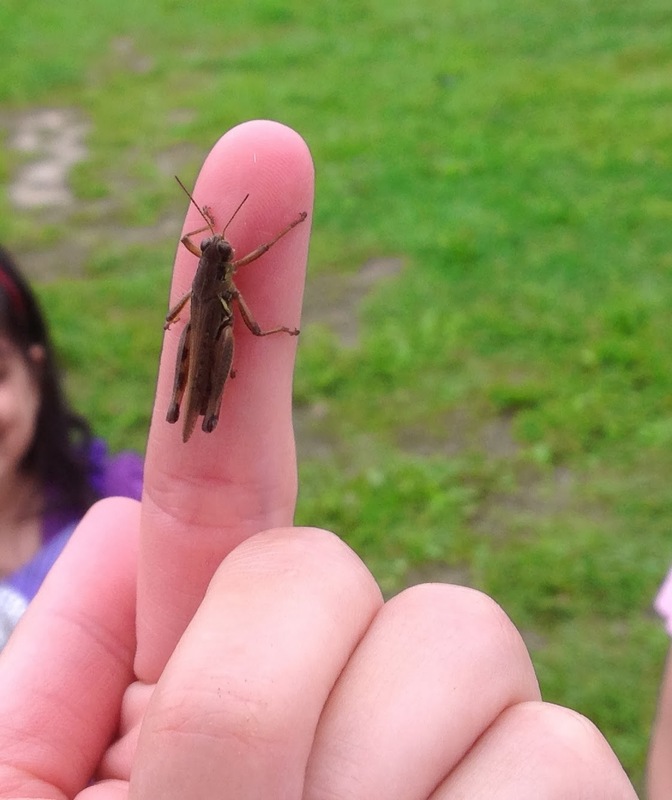 Saying goodbye to a grasshopper we "adopted" for an afternoon after catching it in the long-grass of the no-mow zone. 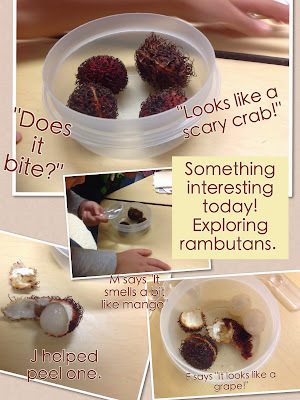 Students were delighted (and some disgusted) by my exotic snack one day. A few select students recognized the fruit as being close to lichees and 'long an' fruit which they had seen before. We found a cricket and some ladybugs on this walk through the no-mow zone, and brought them back to the yard to house them in the glass house for safe observation. Students were immediately concerned about the interaction between the large cricket and the smaller ladybug. Many wonders arose before we released both creatures, unharmed. 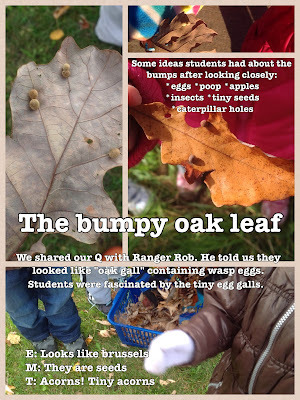 One of several such oak leaves brought into the class to explore up close. Frost, like sunlit dew, makes every 'ordinary' thing in the world somewhat spectacular. It's possible that you could hear our class from a block away, when one student discovered the gift of the milkweed pod and opened it up. 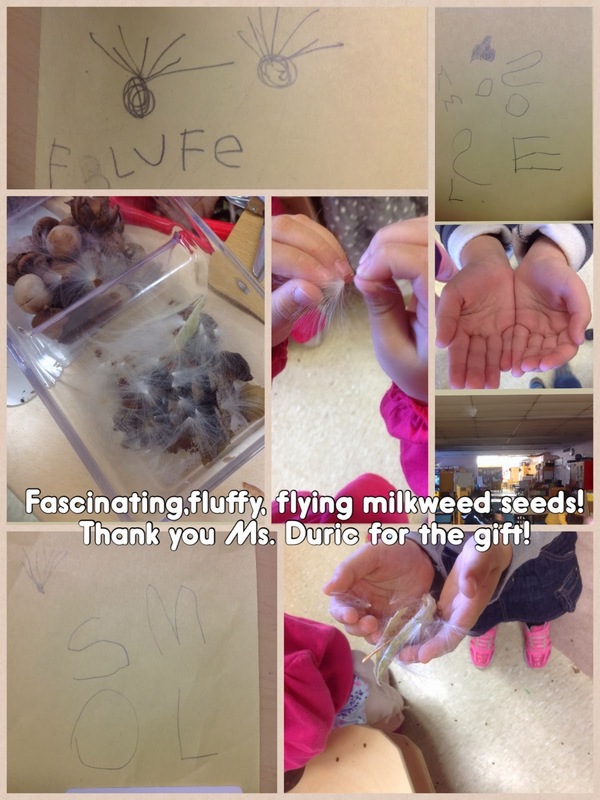 White fluff filled the classroom as students shouted and tried to capture the flighty seeds. 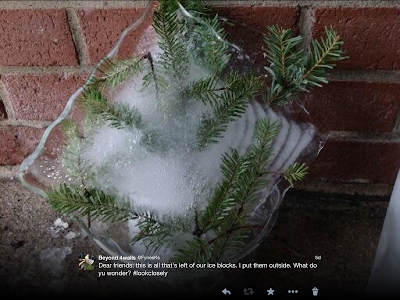 In retrospect, this is a provocation best shared outside. 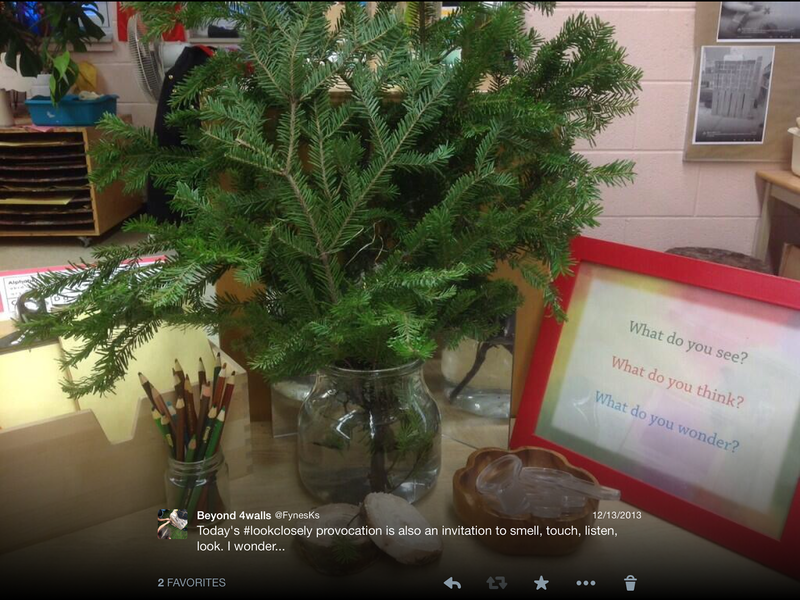 One of the ongoing inquiries in our classes, both morning and afternoon, is surrounding our adopted trees. 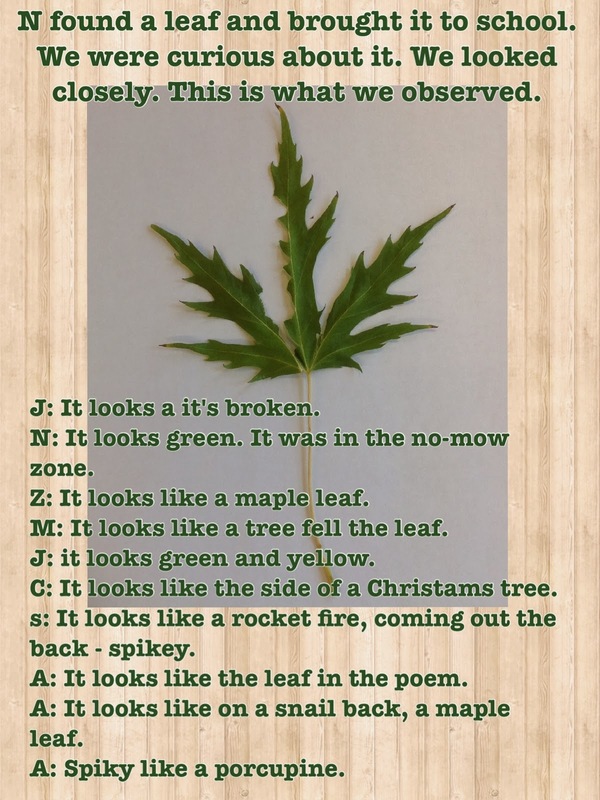 Having chosen our trees earlier in the year, students are now in the habit of observing not only their own class trees but indeed all of them around us. 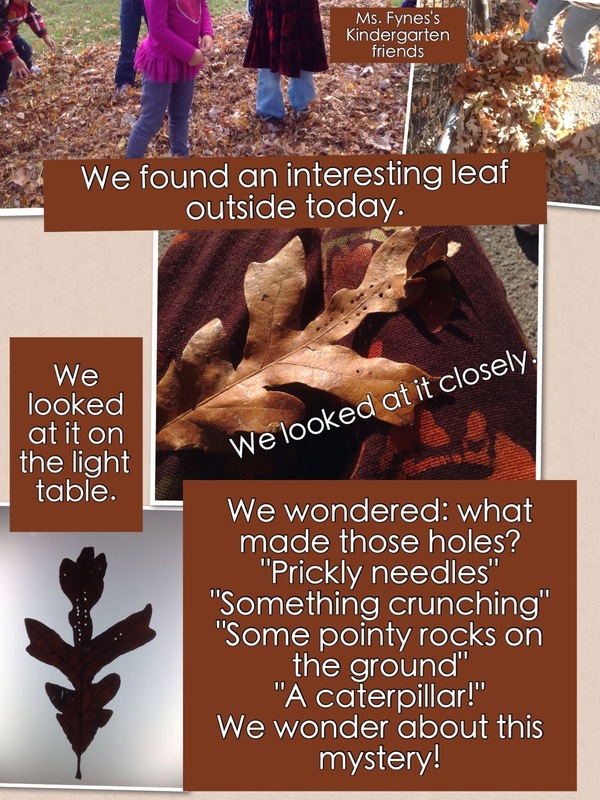 Several students have begun to curate their own projects, using the leafsnap app to identify trees by the leaves they find, or drawing the details they see in fruit, leaves, branches, nuts, or pine cones collected and inspected at the various nature tables in our classroom. I look forward to seeing more writing and deeper reflection as the students continue to apply "looking closely" to their environment throughout the year. I am grateful to this wonderful community and to Heather McKay for the (Frank Serafini) book: "Looking Closely Along the Shore" for inspiring this way of experiencing wonder with my students. Here are a few tweets from November and December showing provocations and student participation at the "look closely" centre in our class. M's banner for our bulletin board sparked an interest in documenting, through drawings and words, what students noticed when examining materials. 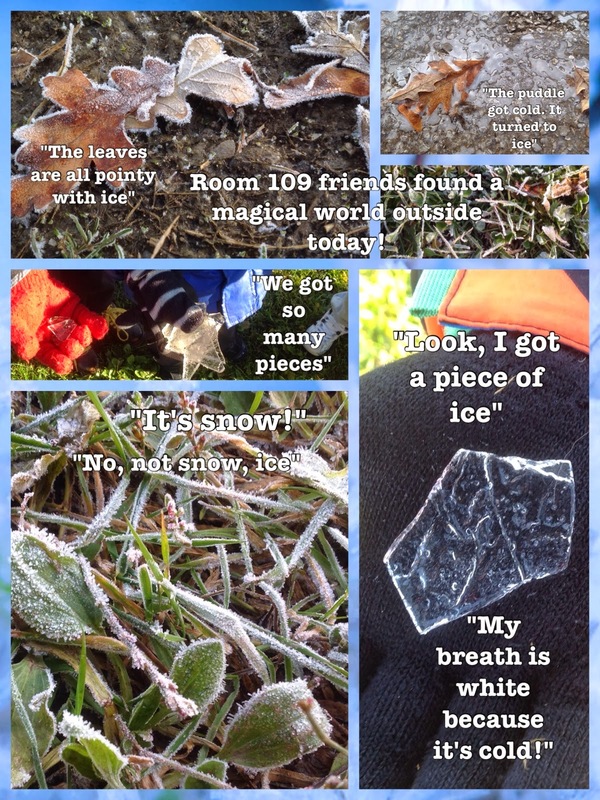 This month, the early onset of winter has brought even more changes and wonderment to my young learners. 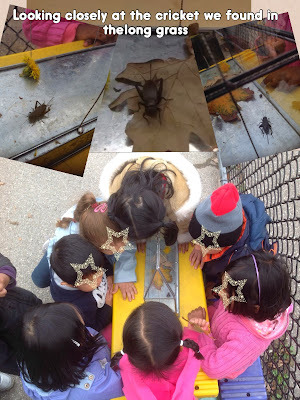 Here are a few snapshots of recent events and ongoing examples of what "looking closely" looks like in our kindergarten class. Exploring tracks outside, recreating inside in sand. One day last month, D and Z got an idea while playing at the water table: "Let's fill this bottle and take it outside!" They did, and within a few days I realized that they had created quite an interesting tool for inquiry about weather, temperature, and states of matter. 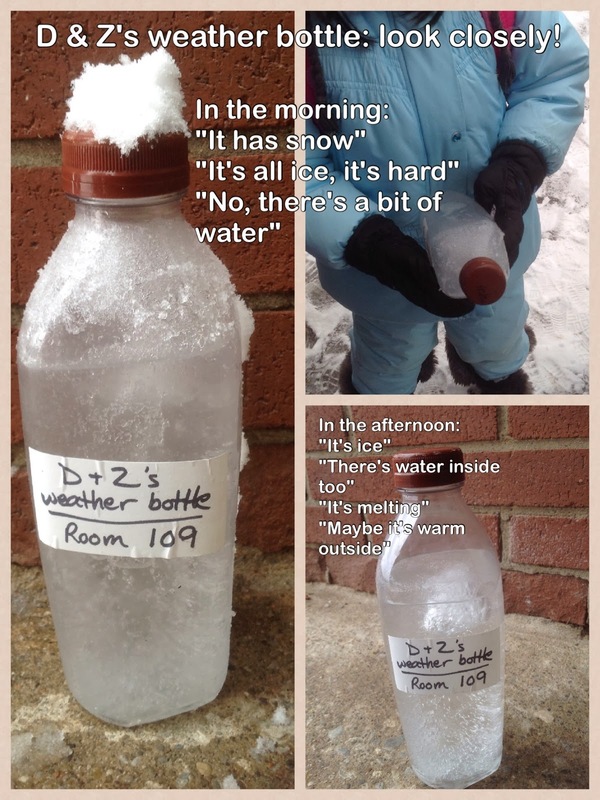 The morning students quickly took notice and began to consult the "weather bottle" daily as well. Inspired in part by D and Z's weather bottle and in part by my love of creating provocations with ice, we froze some balsam fir branches in various containers to explore in the sensory table. 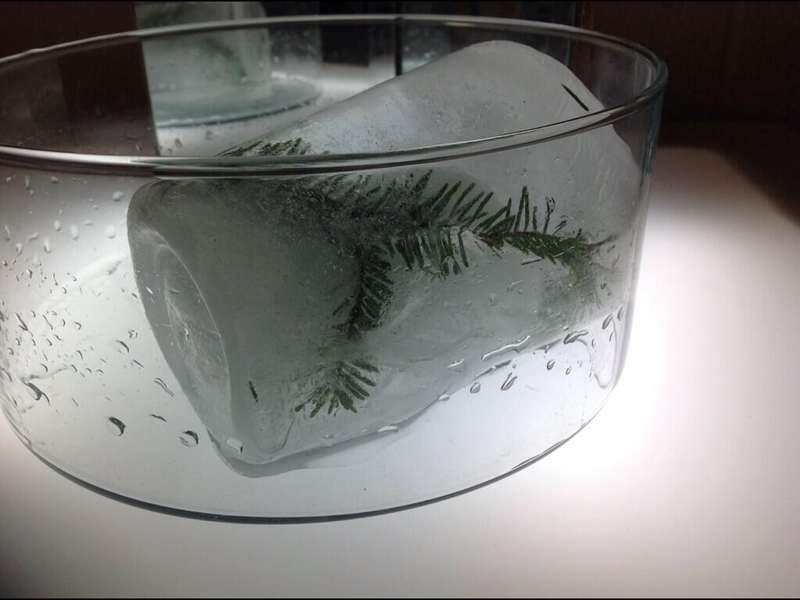 Above, we took one ice block to the light table to examine it closely there too. 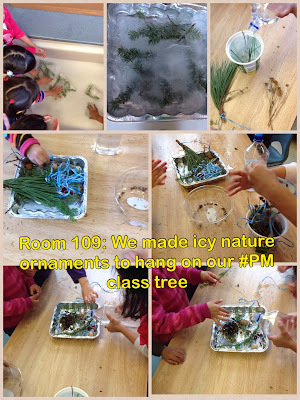 These were such a popular addition to the class that I suggested we use the containers again to create something to decorate our adopted class trees. Afternoon students exploring the ice blocks and creating ornaments to decorate their tree. 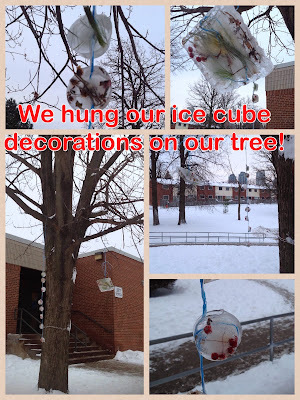 The morning class ornaments hung from our beloved silver maple tree. 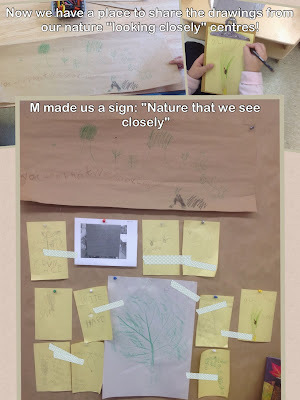 "Looking closely" at my class in this way, I see I've gone on for what could easily be two posts, and yet there's so much more to share: our tree inquiry, looking at the smallest creatures in our world, looking at growth and change in flora and fauna as well as ourselves... being aware, being mindful.